Infinite sustain that you can hold your guitar chords or notes with at the touch of a momentary Hold switch and play along with a medium sized hall type reverb. The Hold-Reverb features analog dry path ensuring that your signal stays unaffected. Now with selectable latching or momentary modes*. 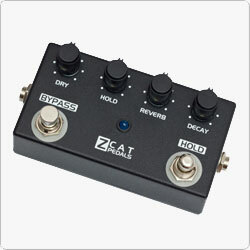 * Hold down the footswitch at power up to select latching or momentary mode.